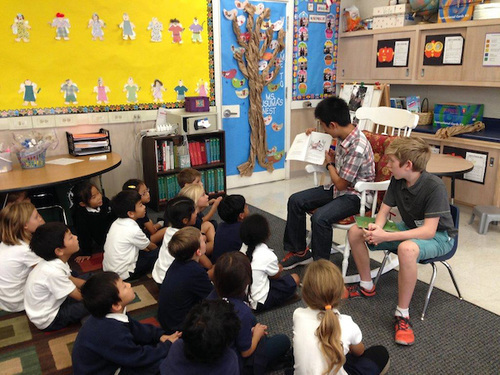 Each year, the upper school Lead and Read program brings Student Council and Honor Council officers to the lower school campus to read stories to the grade 1 classes. The event takes place about eight times a year, most recently on Oct. 16. The program was started by Gautam Krishnamurthi ’11 when he was a senior. His mother, Deepa Iyengar, continues to come a few times a year to read to the first graders in Cindy Proctor’s homeroom. “Deepa came last week with the family dog, Scannon (bought at the Harker Fashion Show). The students loved having them both visit!” shared Proctor.